Hillary Clinton Provides Online Calculator Tool to Illustrate How Her College Plan Will Save Money! The Chronicle spoke with a handful of Clinton supporters who tweeted their calculator results, which varied drastically. While all of them were happy to see how the plan could save them money, some also saw shortcomings in Mrs. Clinton’s approach. The tool is designed to show users their potential savings quickly and easily. But student-loan policies always come with some fine print, and someone who looks at the tool for only a minute or two could easily miss details. Regardless, I give Clinton credit for being creative in assisting students to understand what her policy would mean for them. President Obama Issues Executive Order Guaranteeing Seven Sick Days Per Year for Federal Contract Workers! “Under the rule, companies that have contracts with the federal government starting in 2017 must allow workers on those contracts to accrue up to seven sick days per year. Workers get one hour of paid leave for every 30 they work, capped at 56 hours annually. The workers must be notified each pay period of how much paid leave they have banked, and they must be allowed to roll their time over into a new year. Workers can use that time to care for themselves or a loved one, not just in the event of physical sickness or injury, but also mental illness, domestic abuse and other situations. A lot of workers already have paid leave through their jobs, but many still do not. Just over a third of private-sector workers don’t get any paid sick days at all, according to data from the Bureau of Labor Statistics. Naturally, these workers are disproportionately employed in low-wage service jobs, where skimpy benefits tend to accompany skimpy pay. Access to sick days has improved for those workers recently, but it still lags far behind that of higher earners. Obama’s executive order probably won’t change things for, say, a well-paid defense contractor, who’s probably already got paid sick leave. But it could make a big difference for someone mopping floors or serving burgers inside a federal building. For workers like that, getting sick ― or having a child get sick ― often means either working through illness or having to sacrifice a day’s pay in order to stay home. This is an overdue humane step on the part of the federal government. New Yorker Cover to Show Trump as a Pudgy Miss Congeniality! 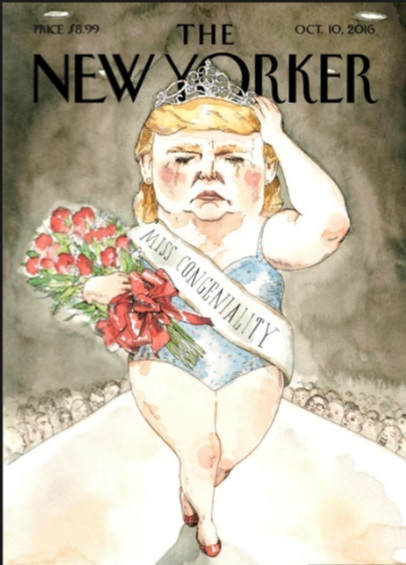 The cover of the October 10th edition of the New Yorker has an image of Donald Trump as a pudgy Miss Congeniality. Incredible caricature given Trump’s references to former Miss Universe, Alicia Macado, as “Miss Piggy”. Aziz Rana: Meritocracy in Obama’s Guilded Age! “The Obama administration’s vision of social mobility in America is bound up with a story about higher education. According to this story, elite colleges and universities are engines of American opportunity. They select the most talented and hardworking people, from across all backgrounds, and provide them with the training to achieve even the most “impossibly big dreams,” as Michelle Obama would say. There is truth to this account. Indeed, Barack Obama’s lived experience speaks to the possibility of meritocratic achievement. He is the multiracial child of a single mother from a middle-class background, who through skill and determination made it to top universities and eventually rose to the highest echelon of political power. But this familiar story of higher education as a spur to social mobility blinds us to both what is pernicious and what is worth defending about the modern American university. Commission on the Future of Undergraduate Education: New Report! The Commission on the Future of Undergraduate Education has just published a report, A Primer on the College Student Journey, that takes an in-depth view of undergraduate education. Published by the American Academy of Arts & Sciences, it has a number of excellent data tables (see sample above) that provide a clear picture of the state of higher education in this country. Below are the Preface and the “Top Ten Takeaways” from the report. Undergraduate education continues to be one of the most important avenues of opportunity in American society, though the landscape is changing rapidly: there are more options than ever before for how and when Americans receive some form of a college experience. New populations of students attend nonprofit public and private colleges and universities as well as for-profit institutions to earn bachelor’s and associate degrees and certificates through face-to-face, online, and hybrid courses. Students of all ages study part time or full time, often at multiple institutions according to schedules that fit their lives, earning credentials ranging from a bachelor’s in philosophy after four years of study to a certificate in medical assisting after four months of study. At the same time, emerging opportunities outside of the traditional boundaries of colleges and universities are increasingly responding to learner’s needs, blurring the lines across postsecondary educational providers and student learning opportunities. To address these topics and provide ideas for ensuring that individual Americans receive the education they need to thrive in the twenty-first century, the American Academy of Arts and Sciences, with generous funding from the Carnegie Corporation of New York, established the Commission on the Future of Undergraduate Education. Over the next several years, the Commission, comprising national leaders in education, business, and government, will study how well students are being served by today’s higher education models and will seek to identify the challenges and opportunities that higher education will encounter in the decades ahead. As a starting point, the Commission requested the creation of a publication that compiled the best data and research available to convey the story of the major trends in undergraduate education through the framework of the student journey into, through, and beyond college. A Primer on the College Student Journey will both serve as a foundation for the Commission’s ongoing work and be of significant interest to college and university employees, higher education policy-makers and philanthropists, business and industry leaders, and students and their families. This brief volume focuses on the pathways students of various backgrounds follow through the abundance of higher education options ostensibly available to them. Further Commission reports will focus more narrowly on topics including student learning, effective teaching, and financial aid. In view of the data presented throughout this publication, we want to acknowledge areas of real strength and accomplishment. It is encouraging to see increasingly higher rates of college enrollment across diverse student populations, with almost 90 percent of high school graduates eventually spending some time in college. We are also encouraged by serious efforts at inclusiveness on traditional residential campuses as well as by the expansion of learning opportunities better suited to the goals and life situations of millions of people who in an earlier day could not realistically consider college as an option. Conversely, our greatest concerns center on the disparities in educational attainment associated with race and ethnicity, income level, and gender. We also note that more students are borrowing more money to pay for college and that those students most likely to default on their loans are those who do not graduate. And we believe that colleges and universities of all types must graduate students at higher rates in a timelier manner. The complexities and challenges our student learners bring to our college campuses need to be at the forefront of our understanding of how our country can best anticipate and respond to their individual needs, as well as the needs of our nation. We want to thank the Commission’s Data Advisory Group—a team of five nationally recognized higher education researchers—who provided invaluable guidance in this data-rich portrait of American postsecondary education, as well as Zack Mabel, Esperanza Johnson, Eliza Berg, and Francesca Purcell, who assisted in its writing. We invite you to keep up to date with subsequent publications, meetings, and activities by visiting www.amacad.org/cfue. College attainment rates are troublingly unequal: Among twenty-five- to twenty-nineyear-olds, in 2015, 50 percent of women had a bachelor’s degree or higher compared with 41 percent of men. Similarly, 72 percent of Asian students earned an associate degree or higher compared with 54 percent of white, 31 percent of black, and 27 percent of Hispanic students. In a related study, only 36 percent of students from low-income families earned a bachelor’s degree compared with 54 percent of students from high-income families. Many college students are academically unprepared for college: One-half of all college students take remedial courses. More students are borrowing more: The proportion of college graduates who took out federal loans increased from about 50 to 60 percent from 2000 to 2012; the median cumulative loan amount increased nearly 25 percent from about $16,500 to $20,400. Students who do not graduate are most likely to default: Students who do not graduate and who take out the smallest loan amounts have the highest default rates. Too few students graduate and too few graduate on time: Only about 60 percent of students earn a bachelor’s degree, taking, on average, almost six years to complete their studies. Only 29 percent of students who start a certificate or associate degree at a two-year college earn a credential within three years. The vast majority of students go to college: More than 85 percent of students who graduated from high school enrolled in college within eight years. Most students get in: More than 70 percent of undergraduates attend colleges that accept over 50 percent of their applicants, while only 1 percent of students attend colleges that accept less than 10 percent of applicants. Students overwhelmingly go public: Choosing among over 4,700 different higher education institutions, almost 80 percent of fall undergraduates are enrolled in public colleges and universities. 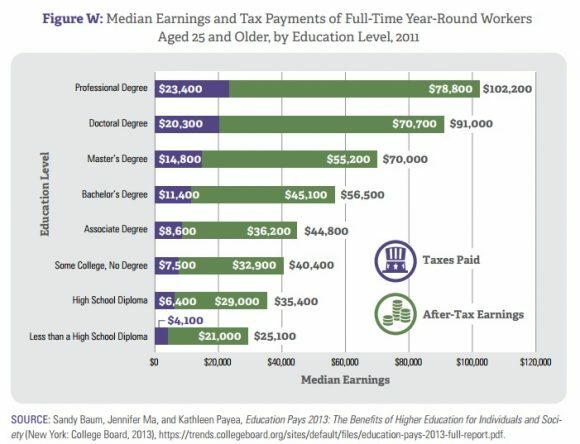 Adults and part-timers matter: Students over the age of twenty-five make up 31 percent of the undergraduate population and students who study part time make up 37 percent; an additional 20 percent of American adults have earned some college credit but no degree. It’s not just about the baccalaureate: Of recently awarded undergraduate credentials, less than half (48 percent) were bachelor’s degrees, while 26 percent were associate degrees and 25 percent were certificates. Michael S. Roth on President Obama’s Higher Education Legacy! “In his first months in office, President Obama announced a series of measures that he described as “the most significant efforts to open the doors of college to middle-class Americans since the GI Bill.” In vowing to reverse the trend that had made colleges — public and private — less and less affordable to more and more people, he articulated a “North Star goal” for the country: to have the highest proportion of college graduates in the world by 2020. Eight years later, the United States has seen only modest gains in educational attainment, and there is little change in our relative position in this regard. Does this make the Obama legacy a failure? I don’t think so. The Obamas have made a strong case for the value of higher education, and they’ve done it during a period of disinvestment by states in their university systems and intense criticism of higher education generally. Silicon Valley gurus and higher-education journalists (who themselves have college diplomas) write about the oddity of students getting degrees that don’t have a direct connection to their jobs. Pulling the ladder up after they’ve already made the climb, they claim not to see why future students would want the same opportunities that they’ve had. The administration was wrong to narrow the value of a college degree to a salary-based return on investment, but there would be even more skepticism about higher education without the Obamas’ support for “reaching higher” through learning. Sure college should prepare people for work, but it can do so in the context of preparing them for life beyond the university. American thinkers like Benjamin Franklin and W.E.B. DuBois, Jane Addams and Martha Nussbaum would agree. Dr. Roth’s essay is a fair review of the Obama legacy and provides lots of food for thought on where American higher education is heading as a result of President Obama’s policies and positions. The recent edition of The Chronicle has responses to Roth’s essay from Danielle Allen, Janet Halley, Raynard S. Kington, Anthony P. Carnevale, Marta Tienda, and Jamie Merisotis. Hillary Wins the First Debate by a Nose! 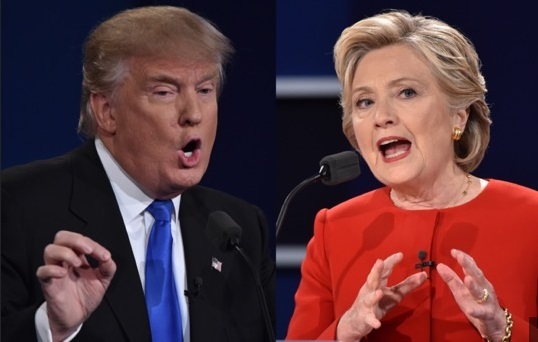 The first presidential debate was held last night at Hofstra University and Hillary Clinton edged out Donald Trump by a nose or two. There weren’t any “aha” moments or major gaffes although Donald Trump came close. Clinton was well-prepared and remained poised. Trump was close to losing his temperament throughout the second half of the debate. Lester Holt, the moderator, did a fine job of keeping the candidates on message. Trump started with an effective attack on Clinton’s support of trade agreements that resulted in the loss of millions of jobs to other countries. He also raised serious questions about the economy under her and President Obama. However, she stood her ground and did not become frazzled. However, the tide shifted to Hillary when Holt asked about racism in the country. Clinton talked about building communities and developing trust between blacks and police. Trump went on a “law and order” binge followed by the need for “stop and frisk” policies. During the second half of the debate, Clinton surely had the upper hand by attacking Trump on his income taxes, birther stand, hurtful comments about women, his position on the Iraq War, and his business acumen mentioning bankruptcies, lawsuits, and “stiffing” contractors. Here Trump was close to becoming unraveled. He went on the defensive and made a series of bizarre statements about a 400-pound hacker on a bed, Rosie O’Donnell, and a rant about asking Sean Hannity about his position on Iraq as if Hannity is some kind of highly–respected newsman. CNN conducted a poll after the debate and from a sample of 400 plus viewers concluded that Hillary Clinton won by a large margin something like 62 to 27 percent. p.s. : The New York Times has a series of quotes this morning about the debate from various personalities that readers might find interesting. A financial wizard who can bring executive magic to government? A straight talker who tells it like it is? An expert negotiator who can fix government and overpower other world leaders? A change agent for the nation and the world? The entire editorial appears below. Why Donald Trump Should Not Be President! Donald Trump is a man who dwells in bigotry, bluster and false promises. When Donald Trump began his improbable run for president 15 months ago, he offered his wealth and television celebrity as credentials, then slyly added a twist of fearmongering about Mexican “rapists” flooding across the Southern border. From that moment of combustion, it became clear that Mr. Trump’s views were matters of dangerous impulse and cynical pandering rather than thoughtful politics. Yet he has attracted throngs of Americans who ascribe higher purpose to him than he has demonstrated in a freewheeling campaign marked by bursts of false and outrageous allegations, personal insults, xenophobic nationalism, unapologetic sexism and positions that shift according to his audience and his whims. Now here stands Mr. Trump, feisty from his runaway Republican primary victories and ready for the first presidential debate, scheduled for Monday night, with Hillary Clinton. It is time for others who are still undecided, and perhaps hoping for some dramatic change in our politics and governance, to take a hard look and see Mr. Trump for who he is. They have an obligation to scrutinize his supposed virtues as a refreshing counterpolitician. Otherwise, they could face the consequences of handing the White House to a man far more consumed with himself than with the nation’s well-being. Here’s how Mr. Trump is selling himself and why he can’t be believed. Despite his towering properties, Mr. Trump has a record rife with bankruptcies and sketchy ventures like Trump University, which authorities are investigating after numerous complaints of fraud. His name has been chiseled off his failed casinos in Atlantic City. Mr. Trump’s brazen refusal to disclose his tax returns — as Mrs. Clinton and other nominees for decades have done — should sharpen voter wariness of his business and charitable operations. Disclosure would undoubtedly raise numerous red flags; the public record already indicates that in at least some years he made full use of available loopholes and paid no taxes. Mr. Trump, who has no experience in national security, declares that he has a plan to soundly defeat the Islamic State militants in Syria, but won’t reveal it, bobbing and weaving about whether he would commit ground troops. Voters cannot judge whether he has any idea what he’s talking about without an outline of his plan, yet Mr. Trump ludicrously insists he must not tip off the enemy. Another of his cornerstone proposals — his campaign pledge of a “total and complete shutdown” of Muslim newcomers plus the deportation of 11 million undocumented immigrants across a border wall paid for by Mexico — has been subjected to endless qualifications as he zigs and zags in pursuit of middle-ground voters. Whatever his gyrations, Mr. Trump always does make clear where his heart lies — with the anti-immigrant, nativist and racist signals that he scurrilously employed to build his base. He used the shameful “birther” campaign against President Obama’s legitimacy as a wedge for his candidacy. But then he opportunistically denied his own record, trolling for undecided voters by conceding that Mr. Obama was a born American. In the process he tried to smear Mrs. Clinton as the instigator of the birther canard and then fled reporters’ questions. Since his campaign began, NBC News has tabulated that Mr. Trump has made 117 distinct policy shifts on 20 major issues, including three contradictory views on abortion in one eight-hour stretch. As reporters try to pin down his contradictions, Mr. Trump has mocked them at his rallies. He said he would “loosen” libel laws to make it easier to sue news organizations that displease him. His plan for cutting the national debt was far from a confidence builder: He said he might try to persuade creditors to accept less than the government owed. This fanciful notion, imported from Mr. Trump’s debt-steeped real estate world, would undermine faith in the government and the stability of global financial markets. His tax-cut plan has been no less alarming. It was initially estimated to cost $10 trillion in tax revenue, then, after revisions, maybe $3 trillion, by one adviser’s estimate. There is no credible indication of how this would be paid for — only assurances that those in the upper brackets will be favored. If Mr. Trump were to become president, his open doubts about the value of NATO would present a major diplomatic and security challenge, as would his repeated denunciations of trade deals and relations with China. Mr. Trump promises to renegotiate the Iran nuclear control agreement, as if it were an air-rights deal on Broadway. Numerous experts on national defense and international affairs have recoiled at the thought of his commanding the nuclear arsenal. Former Secretary of State Colin Powell privately called Mr. Trump “an international pariah.” Mr. Trump has repeatedly denounced global warming as a “hoax,” although a golf course he owns in Ireland is citing global warming in seeking to build a protective wall against a rising sea. In expressing admiration for the Russian president, Vladimir Putin, Mr. Trump implies acceptance of Mr. Putin’s dictatorial abuse of critics and dissenters, some of whom have turned up murdered, and Mr. Putin’s vicious crackdown on the press. Even worse was Mr. Trump’s urging Russia to meddle in the presidential campaign by hacking the email of former Secretary of State Clinton. Voters should consider what sort of deals Mr. Putin might obtain if Mr. Trump, his admirer, wins the White House. There can be little doubt of that. But voters should be asking themselves if Mr. Trump will deliver the kind of change they want. Starting a series of trade wars is a recipe for recession, not for new American jobs. Blowing a hole in the deficit by cutting taxes for the wealthy will not secure Americans’ financial future, and alienating our allies won’t protect our security. Mr. Trump has also said he will get rid of the new national health insurance system that millions now depend on, without saying how he would replace it. The list goes on: He would scuttle the financial reforms and consumer protections born of the Great Recession. He would upend the Obama administration’s progress on the environment, vowing to “cancel the Paris climate agreement” on global warming. He would return to the use of waterboarding, a torture method, in violation of international treaty law. He has blithely called for reconsideration of Japan’s commitment not to develop nuclear weapons. He favors a national campaign of “stop and frisk” policing, which has been ruled unconstitutional. He has blessed the National Rifle Association’s ambition to arm citizens to engage in what he imagines would be defensive “shootouts” with gunmen. He has so coarsened our politics that he remains a contender for the presidency despite musing about his opponent as a gunshot target. Voters should also consider Mr. Trump’s silence about areas of national life that are crying out for constructive change: How would he change our schools for the better? How would he lift more Americans out of poverty? How would his condescending appeal to black voters — a cynical signal to white moderates concerned about his racist supporters — translate into credible White House initiatives to promote racial progress? How would his call to monitor and even close some mosques affect the nation’s life and global reputation? Would his Supreme Court nominees be zealous, self-certain extensions of himself? In all these areas, Mrs. Clinton has offered constructive proposals. He has offered bluster, or nothing. The most specific domestic policy he has put forward, on tax breaks for child care, would tilt toward the wealthy. Michelle Obama Hugs George W. Bush at the Opening of the National Museum of African American History and Culture! 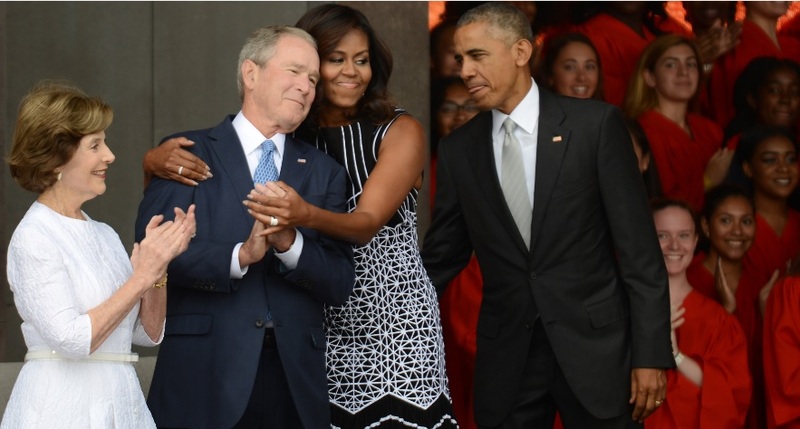 At Saturday’s opening of the National Museum of African American History and Culture, Michelle Obama gave George W. Bush a warm hug. The image has gone viral over the Internet. Wouldn’t it be great for the country if more of our political leaders especially those in the U.S. Congress, could share similar moments of togetherness. On the eve of the first presidential debate, the New York Times, not unexpectedly, endorsed Hillary Clinton for president commenting that she has made “a lifetime’s commitment to solving problems in the real world that qualifies her for this job, and the country should put her to work.” The endorsement also characterized her opponent, Donald Trump, as someone who “discloses nothing concrete about himself or his plans while promising the moon and offering the stars on layaway.” Below is the entire endorsement.